At Mathnasium, we help kids understand math by teaching the way that makes sense to them. Children who consistently attend sessions at our learning centers enjoy a transformative learning experience and make huge strides in the classroom. Attitude: When math makes sense, kids develop a more positive attitude toward math. Understanding: Mathnasium teaches for understanding, giving students the ability to succeed in any math environment. As Larry Martinek, Mathnasium’s Chief Instructional Officer notes, “It's pretty easy to forget things you memorize and near impossible to forget things you understand." School Progress: When kids learn math in a way that they truly understand, they achieve greater success in the classroom. 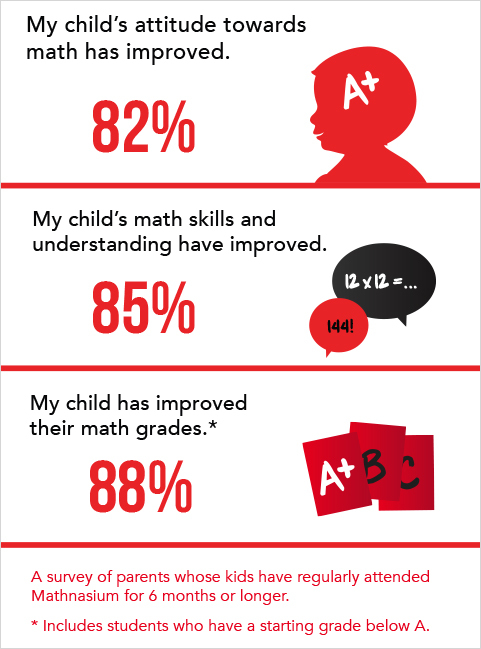 "Mathnasium has been great for my son! When he first started two years ago he was below the benchmark. Now he exceeds the benchmark, enjoys math time at school and loves going to Mathnasium!" "My daughter has brought her pre calc class up to an 87- second highest in her class. She will continue to use your tutor program weekly!!!" "Daughter has been going to Mathnasium (North Beverly, MA) for over a year now and we clearly see the difference in her grades. Good staff who takes an interest in teaching." "I have recommended your company to several families in Hamilton. My son feels like he has a good handle on the math concepts reivewed and acquired at Mathnasium." "Bottom line--my son has more confidence and is more comfortable and gets better grades in math." "So far my daughter is really benefiting from Mathnasium. She enjoys the tutors and looks forward to going!" "We couldn't be more happy with how our son has done a complete 180 degrees in the math department. " "The staff is very professional and worked well with my child. I greatly appreciate the help she received and her SAT score went up 110 points! I would highly recommend this program. "My daughter felt confident and successful in her math skills. She enjoyed having a variety of tutors. I appreciate the quick feedback per session and the pre and post assessment which measured her growth. We have taken a break because of the Fall sports schedule which (hopefully) will end very soon! "What a find! We drove past it a few times wondering what it was all about. It got us thinking and when we took a good hard look at the Public School math program, we realized that supplementing it made a lot of sense. So, we visited with Jim and before long our 4th grader was a regular at the place. She now loves math and the improvement in her skills is striking. Seeing all the fun that our daughter was having, our 2nd grade son, who seems to have a real aptitude for math, insisted on joining in. Both are kids are having a ball with Jim and his staff - and they are really learning math! Math was my strong suit and I thought I'd be my kids' math tutor. But non-family is so much more effective. Highly recommended - give it a try." "I have a 4th grader who has been struggling with math. Jim and all the Mathnasium staff have been great in not only helping my daughter with her homework and general math concepts, but installing confidence in her abilities. I overheard her say yesterday, 'I'm great at math!' She loves going to the Mathnasium. I couldn't recommend them more." "I never thought I would hear my kids speak so favorably about math. My 8th grader and 6th grader have always felt weak at math, and I wasn't much help given my own struggles with the subject. When I decided to try Mathnasium, my hope was that I would see some improvement in their grades. After three months their grades are great but, most importantly and surprisingly, their confidence and enjoyment of math have skyrocketed! I never thought I would hear my kids speak so favorably about math. Thanks to their new confidence and competence, I now feel like they have every door open to them when it comes to math-related fields of study and professions. I'm a single parent and we had to tighten our monthly budget to accommodate Mathnasium, but the results have been well worth every penny of this investment. -Jill Keep up the fantastic work! :)"
"Short and to the Point Posted on April 15th, 2011 by Mathnasium Matters in Success Stories 'The girls now think that Mathnasium is the best thing ever.' That's a direct quote! Nuff said." "We are thrilled with the success of the Mathnasium program and would recommend it to anyone whose child is having difficulty with math. Posted on April 8th, 2011 Dear John, Before enrolling in Mathnasium our 10-year-old daughter Cate was having a difficult time with Math. She was receiving C's on her exams and report card and was extremely frustrated with math homework. Her confidence level was very low and she was not able to learn any new math skills. Our efforts at home to help were only leading to more frustration and extreme tension at home. We enrolled her in Mathnasium in May of 2010 and immediately we saw an improvement. Cate enjoyed attending her sessions at Mathnasium and began to actually enjoy math. She finished out the school year with a C in math but with a little bit of confidence that she could get better. She attended Mathnasium all summer and upon entering 5th grade had acquired a level of confidence she did not have before. She has continued with Mathnasium and is consistently receiving high 90s and 100s on her math exams, completes her math homework on her own and without frustration and received an A on her report card in math. We are thrilled with the success of the Mathnasium program and would recommend it to anyone whose child is having difficulty with math. Cate has been attending Mathnasium for 6 months and now can confidently say that she enjoys math and is good at it! Thank you and your excellent staff for helping Cate through a difficult time and for helping her to reach her full potential." "I really like this class because every day I know I'm going to learn something new." "You can't make math any easier." "It should be called Attitud-asium!" "I never thought I could do math. Now I know better." "Before I came to Mathnasium, I could sum up everything I felt about math in one word; 'EVIL!' I hated math. I used to think that if the devil had a last name, it would be 'Math!' Numbers and equations always confused me, patterns and graphs made me sweat, and let's not even get started on measurements. Mathnasium has been my safe haven. They truly have shown me the light when it came to addressing my fear and provided me with the tools that I need to rebuild my prior knowledge so that I won't forget it. Trust me, I won't! Math is no longer a subject I shy away from but it is a subject I can boldly accept and understand. I went from failing tests to scoring 100 points higher on my SATs in less than two months. Now that's a real 'test'imony! I have raised my confidence and my best scores, all thanks to Mathnasium!" "This approach completely changed how I think about math." "She thinks math is more fun and enjoys going to Mathnasium!" "She is more enthusiastic, more interested in math homework." "He is really excited to go to Mathnasium!" "I first noticed her improvement when her dad and I were discussing a possible upgrade to her cell phone. When we learned the price, I blurted, 'WOW, $117, well we may have to wait on that!' and her immediate response was, 'Mom, if you two split it, that's under $60 a piece, $58.50 to be exact.' I was so impressed by her response... This may seem as just simple math to you, however, my 11-year-old would not have been able to calculate that just a few months prior." "My daughter absolutely loves your program!" "More good news is that I just received her report card and she went from a D, subject to a Fail in math, to a C-E-E, in just 5 weeks. The grade also included a teacher's comment of 'I'm proud of your child's achievement.' Thank you SO much for your efforts and expertise. You (and the Mathnasium program) truly make a difference!" "She asks to come to Mathnasium... keep up the good work." "... (Sarah) is so excited because she now has an 83 in Algebra II and is steadily climbing. She should be able to finish with a strong B if she keeps this up. I know she'll want to tell you all about it tonight if you're still there... It's neat to see her excited about math for the first time ever!" "He is no longer scared of math... he asks to go to Mathnasium." "Kailee's confidence has improved tremendously in all her subjects. Mathnasium has not only helped in math, it's helped in all her subjects. All of Kailee's grades have improved. She made honor roll for the first time since pre-K this year. Thank you Mathnasium!" "She has proclaimed she likes math now; she also says she's getting more math done at school." "Last week the 4th grade had its math benchmark test. Gracie made 91% and had the 4th best grade in her [class of about 40 students]. Gracie was so excited, as were we. Thanks." "She's more willing to do her homework and she's less afraid to take tests." "Just a quick note to let you know [how helpful] you have been with Ali and her math class. As a result of her time spent at Mathnasium… she [improved] her SAT score [and] her pre-calc class was a much more positive experience because of [your] help... I will share our success with anyone I know who might have a need for your service." "...Math isn't a task anymore, but a challenge." "I just wanted to send you a quick note regarding Raven's math grade this last grading period. Raven has always made A's or B's on her report card in math but she has never made 100%…I am pleased to inform you that this last grading period she made 100%! Raven loves going to Mathnasium. I think she is really starting to see the benefit in her going at least once a week if not more. Every week she even asks me what days she will be going that week in order for her to clear her schedule to make time to go. Thanks for all that you do and keep up the good work." "She loves to come here; she would get anxious and frustrated just talking about math before. Now she feels more confident about her ability and relaxed about the subject." "Amanda is in advanced classes, and is for the most part an A student, but she struggles with math, and her grades had gone down to B's and C's... This week, all of the students in her math class were struggling with their lesson—none of them got it. Amanda raised her hand and proceeded to show her classmates how to solve the problem the way Marc taught her." "She feels better about herself since coming here, and understands how to solve problems she is taught." "After only two sessions at Mathnasium she was asking me to take her back for a third session right away. She said that she loves it at Mathnasium!"